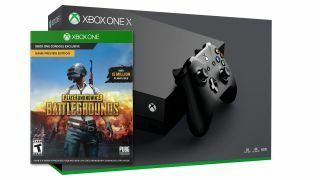 PUBG as a bonus for the usual price of an Xbox One X, only through February 24. Microsoft's sweetened the deal for anyone thinking of picking up an Xbox One X, but this particular promotion won't last long. US customers who pick up the new 4K-ready console by February 24 will also receive a free download code for PlayerUnknown's Battlegrounds on Xbox One, which is normally a $29.99 extra purchase. You can pick one up on Amazon right now. If you've been watching Xbox One X console deals for a while, you'll remember this as the same bonus deal Microsoft offered over the holidays. Maybe you've been sitting, head in your hands, filled with regret ever since you decided to skip it - wondering whether you should just give up buy the console and game individually. This second chance is for you. Don't let regrets rule your life! Xbox One X with PlayerUnknown's Battlegrounds for $499.99. Microsoft's super-powerful console comes bundled with the super-popular 100-person showdown shooter. It's easily the best way to play PUBG on console. If you're giving your console a 4K upgrade, you'll want a nice new television to match, and our list of the best gaming TVs is here to help. Meanwhile, you can check our comprehensive rundown of every Xbox One X enhanced game to see what kind of improvements you can expect to see with your new console and software. And that water in Sea of Thieves is going to look pretty good on your new, X-powered 4K setup. Just saying.